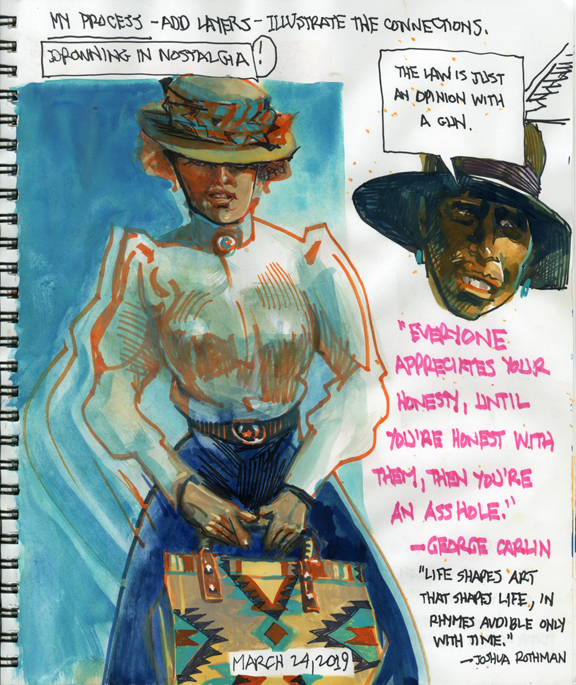 Bob Boze Bell's Big Bad Book of Bad Diary Entries: Do Real Cowgirls Cuss? Got a bit of a controversy going on around here. Just what exactly does it mean that, according to some, the beloved historian, Sharlot Hall, "had a mouth on her"? Daily Whip Out: "Sharlot Talks Back"
And, if she did swear, how strong were the oaths? 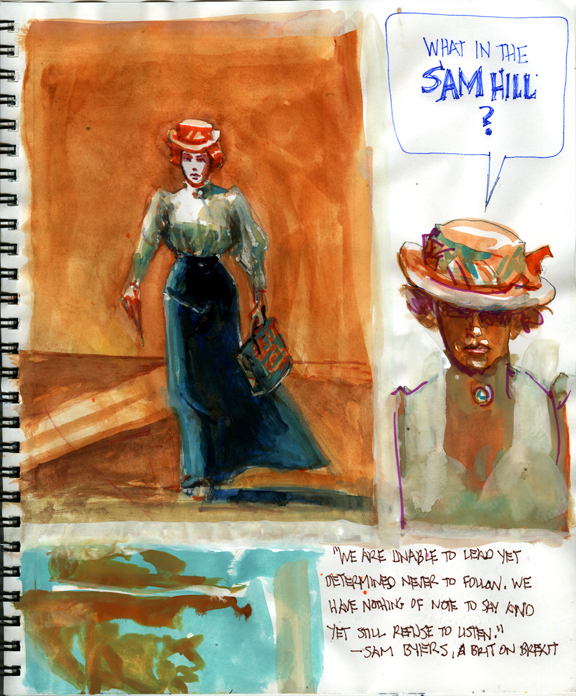 "Sharlot Sketches, 'What in the Sam Hill?'" Since Sharlot lived with her parents on a ranch outside Prescott—in Lonesome Valley—I assume she could swear. Her father certainly could and did all the time. Sharlot writes that one time she challenged him to go for five minutes without swearing and he couldn't do it. Daily Whip Out: "Sketches of Sharlot, Part I2"
"Lol! Oh, my, cuz, I never f---ing swear! "Sh--" is a great standby, and I use "Goddam" for emphasis. "F---" is a real no-no in conversation between the sexes, but it slips out occasionally. Hardly ever use "c---sucker", but I think that's a favorite with the guys. I'll pay attention for a while and see what is said. I will tell you, cowboys try to be gentlemen, and do not curse in mixed company. If Sharlot had a mouth on her, it probably didn't take much, to be given that moniker, and may also have meant she talked back. Just guessing." For the record, I have never heard my cowgirl cuz swear. "Two things: your cousin's take on 'she had a mouth on her' that it might have meant she talked back, is far closer to the truth than your thoughts on a potty mouth. And also, don't ever think Sharlot was a 'regular' ranch girl. She escaped as soon as she could and only came back because she was obligated to care for her father when her mother died. While she carried out all the duties of a ranch woman—even though she was the only woman in the territory to ever get a cattle slaughtering license—ranch life didn't define her. In her writings, she tells how she tried in vain to get the ranch women of the Dewey area involved in intellectual pursuits, finding them as dull and uninspired as the men they were married to. 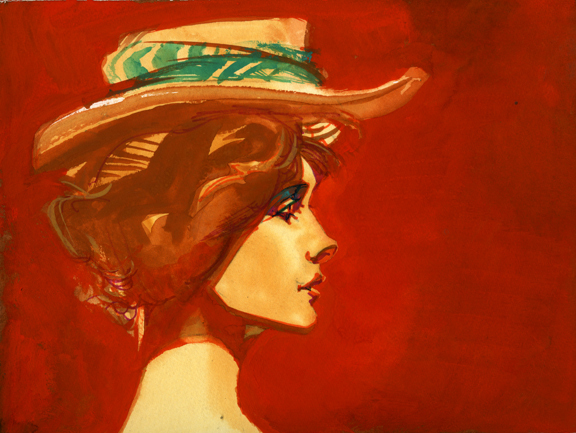 Her friends were the women of the Federation of Women's Clubs—some of them were from ranches, too, but they were like Sharlot, that didn't define their lives. Just some thoughts." 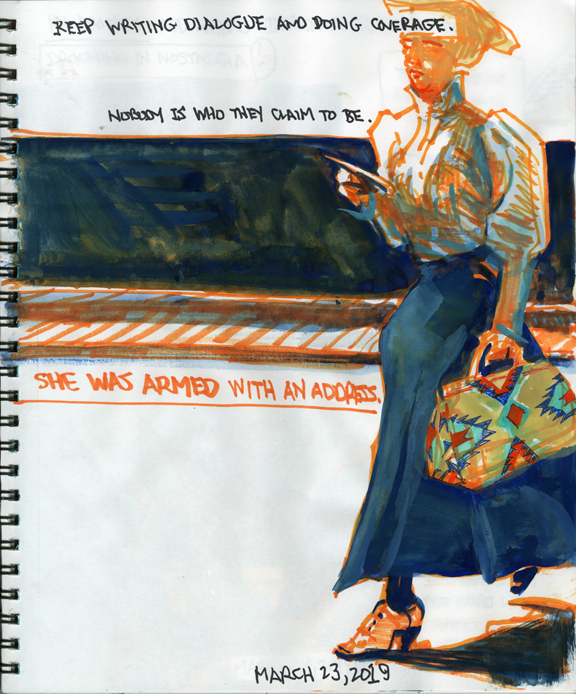 So, I continue on my quest to both capture Sharlot on paper and, well, in the words that come out of her mouth. 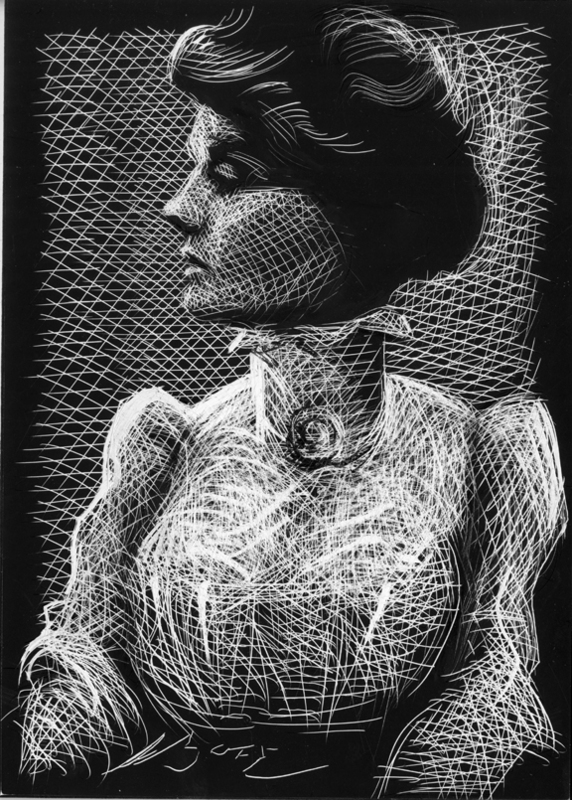 Daily Whip Out: "Armed With An Address"
And back to scratchboard, for the third time. "Life shapes art that shapes life, in rhymes audible only with time." "Art is not a turning loose from emotion; it is not the expression of personality, but an escape from personality. . .only those who have personality and emotions know what it means to want to escape from these things."